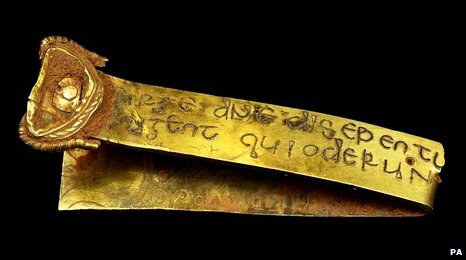 That's what one expert said about the biggest Anglo-Saxon treasure trove ever found -- a huge collection of items, many of them stripped off weapons. This has got to be the hidden wealth of a king or a very successful army at the end of a string of luck. The image above, from the BBC story, is engraved with a biblical verse in Latin: "Rise up O Lord, and may thy enemies be dispersed and those who hate thee be driven from thy face." Says the BBC: "It has two sources, the Book of Numbers or Psalm 67, taken from the Vulgate, the Bible used by the Saxons." If you want to see more -- lots more -- go to this Flickr page and use the slide show. Top story in the UK today, I hear.